Powers/Abilities: Shatterfist wears so-called "Power Gloves" which grant him superhuman crushing power. Although he does not possess superhuman strength per se, he can smash through steel doors with his fists while wearing the gloves. History: (Thor I#458)- Shatterfist was a small-time crook who obtained powerful "Power Gloves", which he planned to use with his gang in a crime spree. With three lackeys, he broke into a bank and smashed open the vault. 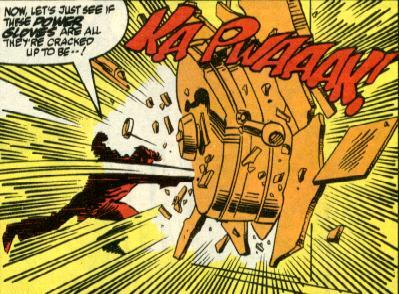 The alarms attracted the attention of Thor, whose identity was at that time worn by Eric Masterson. Eric was shocked to find the super-criminal there, having encountered him before due to a time paradox. When he called him "Shatterfist", the crook decided he liked that name more than "Power Glove", and adopted it as his own. He then assaulted Thor, and beat him badly, with Thor only barely managing to block his attacks. At this time, Eric was concerned about his future, and was afraid that having now met Shatterfist, he could no longer be certain how long he might live. Shatterfist was so intent on beating Thor that he didn't notice an old security guard come up close to him, and place his gun to his head. Although the guard had not fired his gun once in his 30 years on the job, he was able to halt Shatterfist's attack. (Thor I#440)- To battle the combined forces of Beta Ray Bill and both the Eric Masterson and Dargo Ktor Thor, time traveler Arthur Zarrko brought Shatterfist back in time to battle Eric. Although Shatterfist remembered him from their first encounter, from Eric's perspective they had never met before. Eric was thrown off by Shatterfist foreknowledge, but managed to hold him off until Zarrko returned him to his proper time. (Thunderbolts#24-25)- Shatterfist was among the many super-criminals gathered by the Crimson Cowl to serve as a member of her Masters of Evil. He met with the other members at their base at Mount Charteris, but the base was invaded by members of the Thunderbolts, who staged a series of quick pick-offs, so that they could defeat several of the Masters and then don their uniforms. 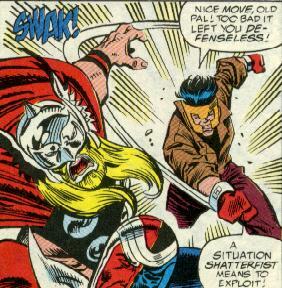 Shatterfist was defeated by Jolt, and his costume was subsequently worn by Atlas to spy on the Masters of Evil. (Dark Reign Files) - Quasimodo researched Shatterfist for Norman Osborn. Comments: Created by Tom DeFalco, Ron Frenz and Al Milgrom. Shatterfist was among the villains who opposed Eric in Thor I#457, as he sought to free the real Thor from his prison within his own mind; Shatterfist's appearance served to remind Eric that as they had not yet clashed, there was still a chance for him to succeed.